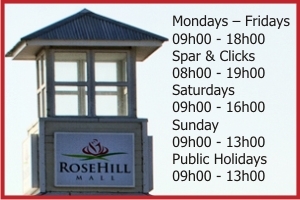 Rosehill Mall is a coastal shopping center in Port Alfred that packs in every innovation to delight shoppers, from spectacular interior designs featuring a beach-style avenue linking the shops to an astounding close-quarters view over the Eastern Cape shoreline nearby. Famous retailers have been carefully chosen to provide the broadest possible shopping experience and maximum convenience for those in and around the charming seaside resort on the Kowie River. Facilities include parking, cinemas, and restaurants. Natural air and light make the mall a healthy entertainment option for kids.